Kelela serves a sundry of looks in her fiery new video for "LMK," the first single from her upcoming debut album. She storms in the function rocking a blonde wig, beaming from behind tinted frames. There's also a red-head moment in a cushioned corridor and, later, an all-white, silver-accented outfit. When the beat drops, the frequency in the room rises as the self-aware singer breaks out into bold choreography that recalls the sultry confidence of '90s R&B. As Kelela twirls through a packed dance floor, it's clear that if her potential fling declines a night of fun, the party won't stop with him. 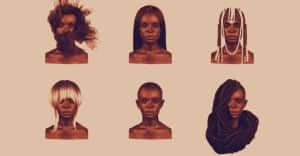 "The song is directed at a man who's being weird instead of being honest," Kelela told The FADER over email. "Does casual have to be careless? Is wifey the only woman who deserves your respect, and why do you think I want more when I demand it? These are my questions..."
Warp Records will release Kelela's debut album, Take Me Apart, on October 6. Preorder it here.